(Left to Right): Michael Nash (OCP), Taylor Lytle (ARC), Xavier Bruttomesso (National Foster Youth Institute), Supervisor Mark Ridley-Thomas, Dr. Jacquelyn McCroskey (Children’s Data Network), Jesse de la Cruz (Alliance for Children’s Rights), Supervisor Hilda L. Solis, Lawrence Winston (NFYI), and Julio Marcial (Liberty Hill). All photos by Martin Zamora / Board of Supervisors. Julio Marcial, Director of Youth Justice with the Liberty Hill Foundation, Taylor Lytle, Youth Advocate with the Anti-Recidivism Coalition (ARC), and Jesse de la Cruz (Alliance for Children’s Rights), provide testimony during the Board of Supervisors meeting. 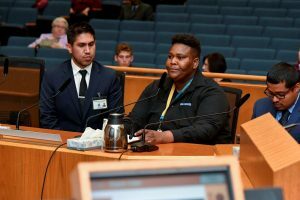 Several other former dual status youth, connected to advocacy organizations like Alliance for Children’s Rights and National Foster Youth Institute, provided compelling testimony at the Board meeting. 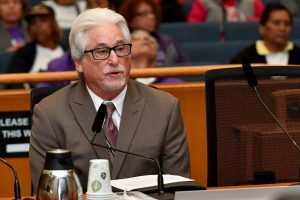 Michael Nash, Executive Director of the Los Angeles County Office of Child Protection (OCP), speaks in support of the motion, which charges the OCP with convening the workgroup that will draft the Countywide plan. The OCP is uniquely poised to lead this work. It will liaise with the Juvenile Court; convene affected youth, and the County departments and community stakeholders serving them; identify funds to enhance services; and build on improvements already underway.